← Boating Terminology – When is a Boat a Ship? Why is a Bathroom a Head? Good boat maintenance includes cleaning the thing every now and then. Don’t make it more of a chore than necessary. Cleaning a boat is really quite easy, but there are some special rules you want to consider, especially if you have a holding tank, which I will discuss later. Nobody wants to cast off on a floating pig pen. This article shows you some helpful tips for keeping your boat, well, shipshape. 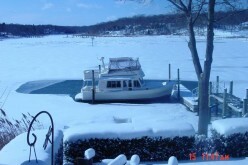 A few years ago I brought my 40 foot Mainship trawler to a marina for winter storage. In the spring they asked me if I wanted them to clean it. “Sure,” I said. May as well take springtime delivery of a nice clean vessel. I was charged $400! The invoice noted that the job took the guy eight hours at $50 per hour. I told the marina manager that the job must have included two lengthy naps, a leisurely breakfast and lunch, and a feature length movie on my TV. A marina, I should note, has possession of your boat until it’s transferred to you. Want your boat? Pay the bill. I considered small claims court, but decided that the amount wasn’t worth the time and aggravation. 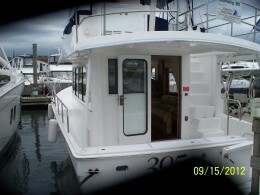 Now to be sure, a 40 foot Mainship is a spacious boat, with a salon, stateroom, head and galley. There is also a fly bridge and a lot of outside deck. But the bottom line is that the vessel is no larger than a studio apartment. After that incident with the pirates at the marina I always cleaned the boat myself. An aquatic environment, especially a salt water marine environment, can cause mold and mildew, something that’s easier to avoid than it is to mitigate. One way to prevent mildew from building up on your cushions and bedding is to prop up the seat or mattress when you depart the boat. This need not be an elaborate procedure. Just life up the cushion or mattress and place something underneath toenable air to circulate. When cleaning the boat, use a good commercial mildew treatment product such as Tilex on the fiberglass surfaces and a simple cup of borax mixed with two cups of hot water on the cushions and fabric surfaces. If you leave mildew untreated it can cause damage to the fabric and possibly create a health problem. Nothing like an ounce of prevention. For carpets on the boat use any commercial carpet cleaning product. Having a wet/dry vacuum aboard is useful for cleaning up spills right away. The key to cleaning canvas tops or sail covers is to be gentle. Canvas isn’t cheap and it’s a lot more economical to clean it rather than replace it. Ivory soap or a product known as Sudbury Boat Zoap work well. If seagulls or cormorants have been playing dive bomb on your canvas you need to do something about it. My trawler had a large canvas top on the fly bridge. Seagulls loved to warm their tummies on a chilly day. To thank me for the use of my boat, they then crapped all over it. Boat Zoap worked great. Some boaters affix lines with fluttering ribbons to scare the birds away. This helps with the squatters and sitters but not with the dive bombers. It’s best to keep on top of canvas cleaning before it becomes a difficult chore. If you have a cormorant problem, keep after it often. Cormorant droppings dry like cement. If you keep your boat at a mooring you have an extra difficult task, because you can’t use a ladder to hose off the top of a tall boat as you could dockside. Fiber glass is easy to clean. By far the easiest way to clean it is to get into the habit of hosing down the boat after a day on the water. Even if you’re tied to a mooring, you can use the water in your fresh water tank to clean of the spray. It’s a good idea whether you boat in fresh or salt water. Fresh water, sad to say, can have a lot of dirt floating in it. There are so many commercial vinyl cleaning products on the market that you have your choice. Boat Zoap can be used on vinyl as well. You will need a soft bristle scrub brush, emphasis on the soft, for cleaning non-skid surfaces on deck. 2007 Sea Doo Speedster 155hp only 76hrs super clean, like new. There is nothing different about cleaning the interior of a boat than cleaning any area, except for the mold and mildew issues discussed above. Depending on the size of your boat, it’s a good idea to keep a small vacuum cleaner on board to keep from lugging it aboard every time you clean the boat. A small battery operated vacuum is great for picking up crumbs and debris. On the subject of crumbs and debris, the last thing you want is an infestation of ants or other bugs. Regular cleaning should become a habit that you don’t even need to think about. If your boat has a head it has a holding tank. United States Coast Guard regulations, as well as local regulations in every state, forbid you from pumping human waste matter overboard. The waste goes from the head into a tank, and the tank needs to be emptied. This is not a chore to put off. If your tank is approaching capacity, navigate to a pump-out station and get the job done. A holding tank can back up like a sewer. Not a good thing. A word on urine. Human urine, assuming the person has no health issues, is inert and bacteria free. There’s nothing wrong with tossing urine overboard (shortly after it’s expelled from the body). Some women find this offensive and that’s understandable. But for guys, using a small hand held urinal is a good way to keep the holding tank from filling up. Boating is meant to be fun. Regular cleaning is a great way to make sure that your days on the water stay enjoyable.